The last blog left everyone on the road in Beziers having dropped off our bicycles and Relax Rentals. 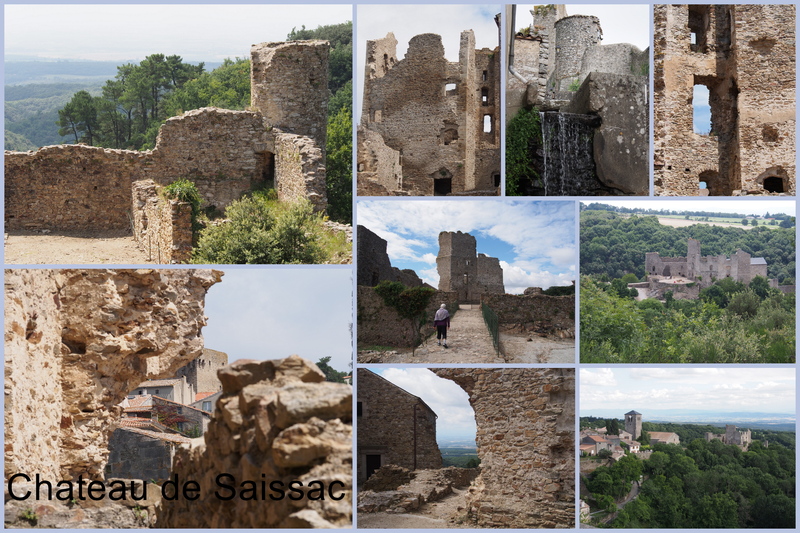 We did make it back to Saissac by train and bus and since then have been exploring south and south-eastern France. 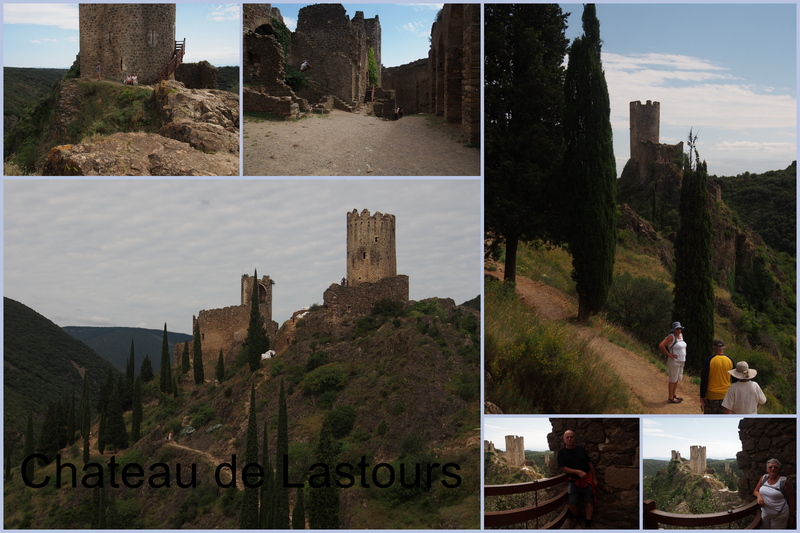 This area includes the Aude Valley and the foothills to the Pyrenees. Historically the area has been invaded many times, settled in by the Romans, conquered by the Visigoths, lorded over by the aristocracy, counts and feudalism, repressed by the Inquisition, administered by the Revolution, devastated by the Nazis, The summation above misses much of the history of the area and each can be delved into and explored in great detail. However, over the centuries the area represents two proud and strong cultures of Occitane and Catalan, both of which have survived through many changes throughout history. We have met people not only in Saissac but also in other areas here that proudly identify themselves as not French but rather Occitane or Catalan. So, as part of our stay here we have made an effort to get out and see a little of the countryside and experience through walks, museum visits, château wanderings and lots of food and wine (!). Below are some pictures of chateaus, castles, museums, art, food, cities and people. That was it for that day. 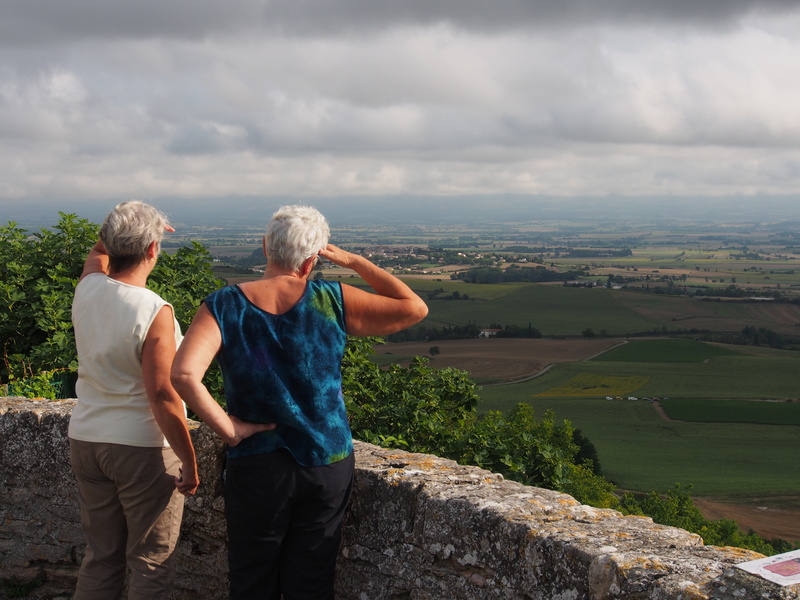 We certainly don’t like to rush things but by the time we got back to Saissac we were so enthralled with our tour that we got up the next morning to head down to view Chateau de Peyerpertuse a Duilhac. 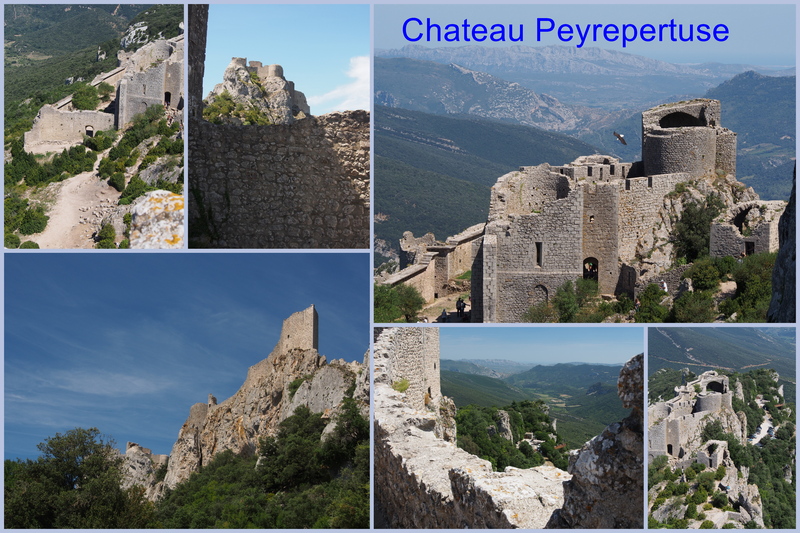 This is a most spectacular Chateau and if one has only one chance to see a Cathar castle then I propose this one is it. It was a beautifully long climb up to the top and we were rewarded a spectacular view out over the valley and could even see the Mediterranean Sea. What a defensive position. Once at the top we timed it perfectly to be treated to a wonderful exhibition of falconry. 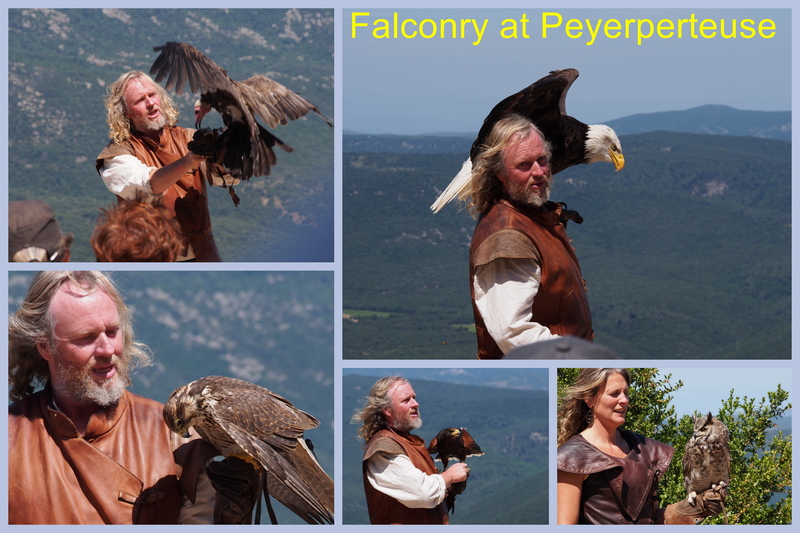 Not only did the falconers have falcons but also vultures, a Pacific North West bald-headed eagle and an owl. Ok enough of chateaus. 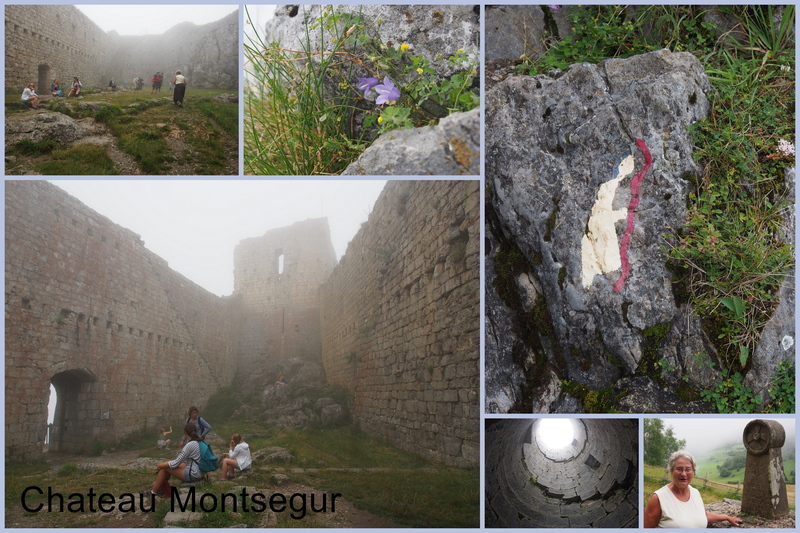 We are now on to Abbeys, On the same day as visiting Peyrepertuse we looped around and headed back to Saissac through Lagrasse stopping for a look at an art gallery and then it was time to head back to Saissac. However, undeterred we headed out the next day to view a few abbeys. Heading east in the morning we went through Narbonne, stopping at the central market to pick up a picnic lunch, and then on to Abbaye Fontfroide. 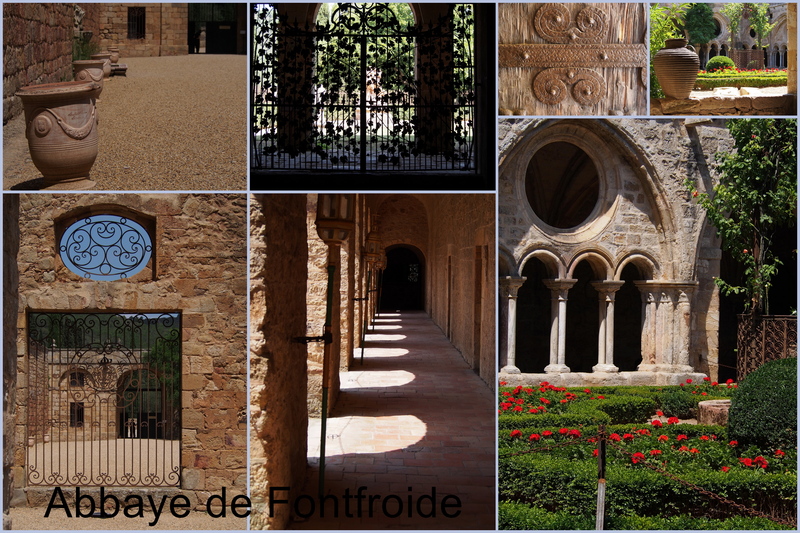 Abbaye Fontfroide is held in private hands and is in amazing condition. As well as the Abbaye acting as a tourist magnet to the region the owners also have vast vineyards producing a corbieres variety of wine of very good quality. 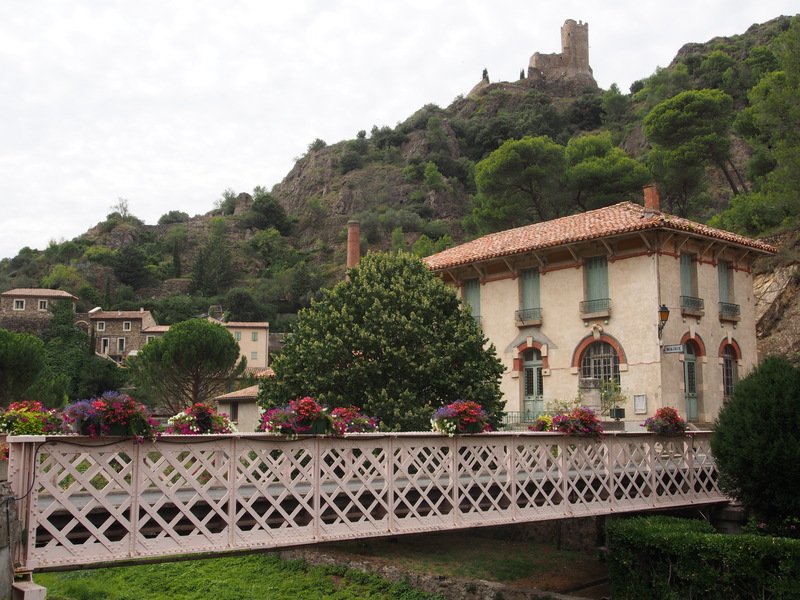 We pulled out our cheeses, cold meats, fresh fruits and drinks on the property of Fontfroide surrounded by roses, planus trees and sculptures. Who can complain. The sun shone, no-one asked us to move on, it was quiet and so we munched on oblivious to the other tourists strolling through looking longingly at our lunch. Planning, planning, plannning….ha, ha. 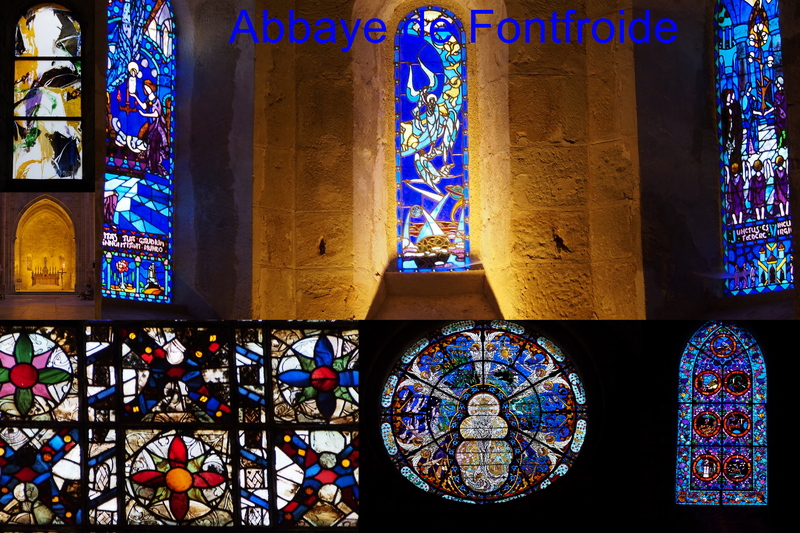 After we walked around the Abbaye staring in disbelief at the beautiful gardens, the stain glass and the abbaye itself. 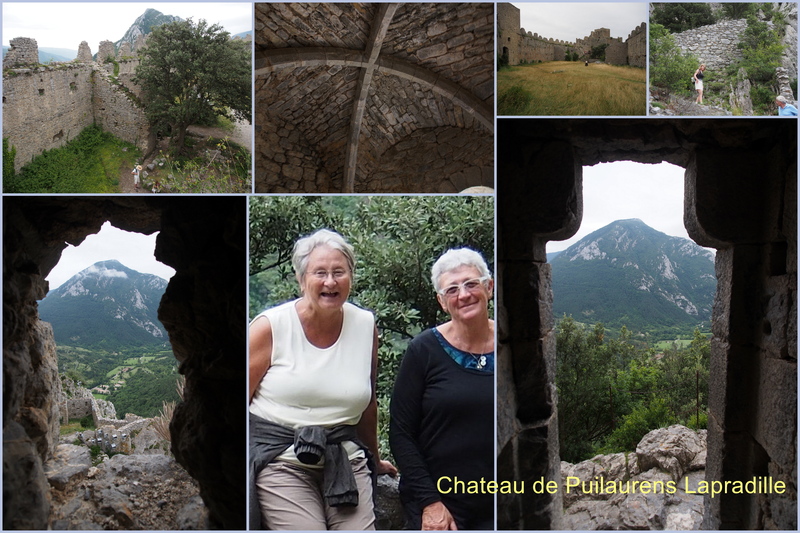 Our most recent foray and the last one for Sue as she was heading back to Victoria was a trip to take in one more abbey and a Chateau. 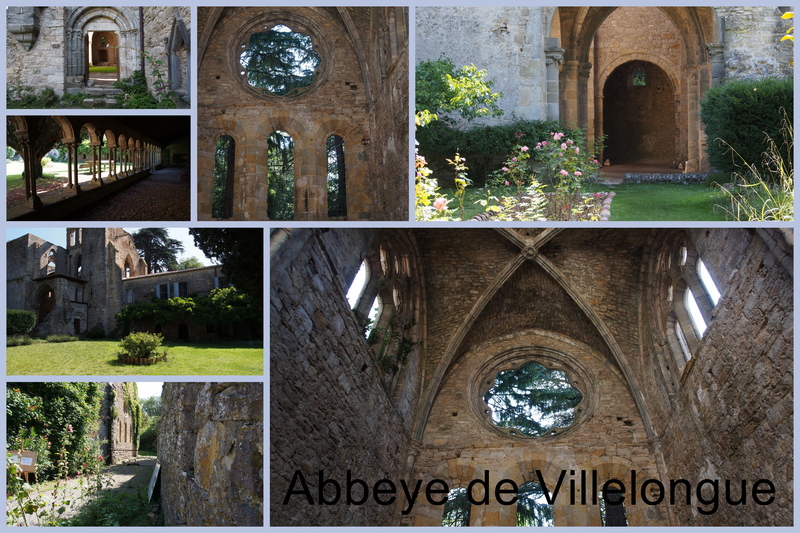 The first was the Abbaye Villelongue. 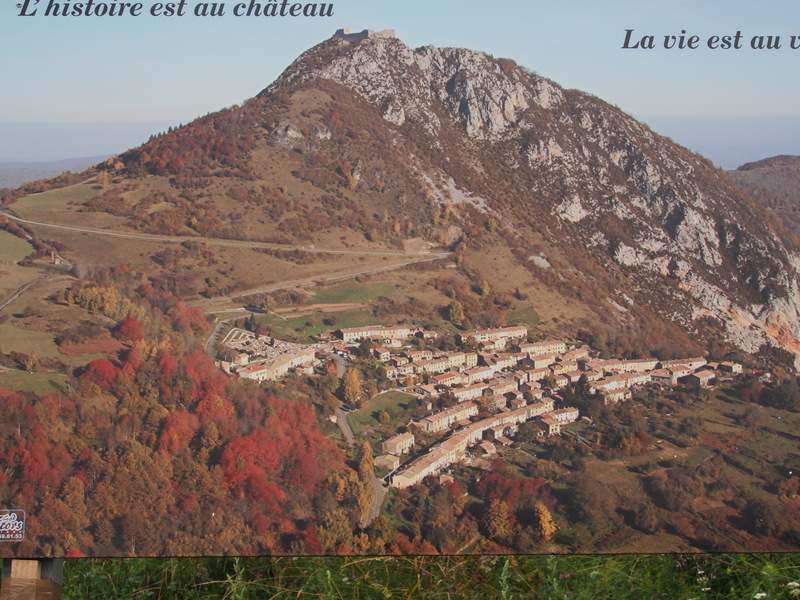 It lies in the valley below us only a 20 minute drive from Saissac. Tucked away in a remote area on a very small road it presented an interesting contrast to all the others abbeys as much is in ruins but it is still a family home. There is a very old garden which is still maintained and productive. It’s also a lovely spot to stay if one was looking for a quiet night or two in the countryside as there are several Auberge D’Hote including one run by the Abbaye. Like all the châteaux, perched on the highest point and from a defensive viewpoint almost impregnable, but not quite for the persistent. No-one actually successfully besieged the châteaux but rather the inhabitants capitulated. There are actually 4 châteaux that make up the whole all of which are in ruin but there is still enough left to give a pretty good idea of their layout. 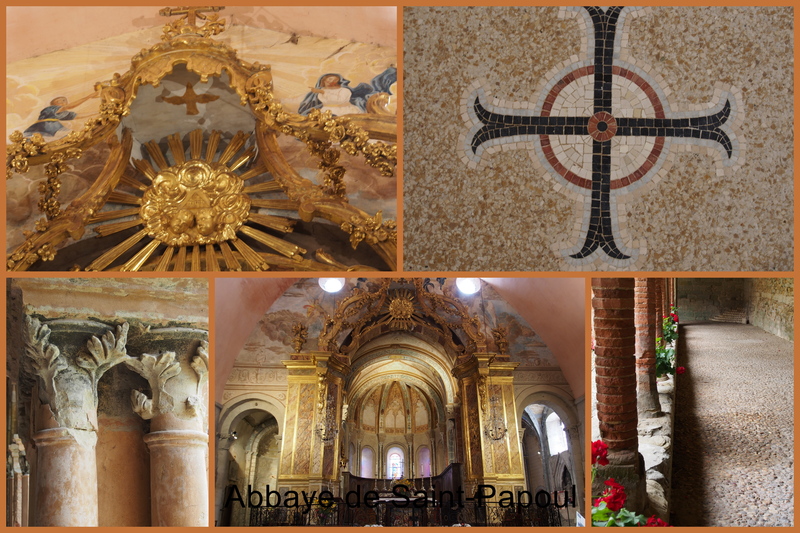 Almost last on the tour of the countryside was the Abbaye de Saint-Papoul. Again, another abbaye close to Saissac and all in pretty good shape. We still haven’t completed our tour but we have lost an adventuring mate, Sue. Thanks Sue for being such a great driver and guide. I tried my best at navigation and we got lost lots of times but we always had fun discovering unexpected gems. And thanks Connie for putting up with all the detours, long days in the car and our penchant for searching out the most outrageous art. 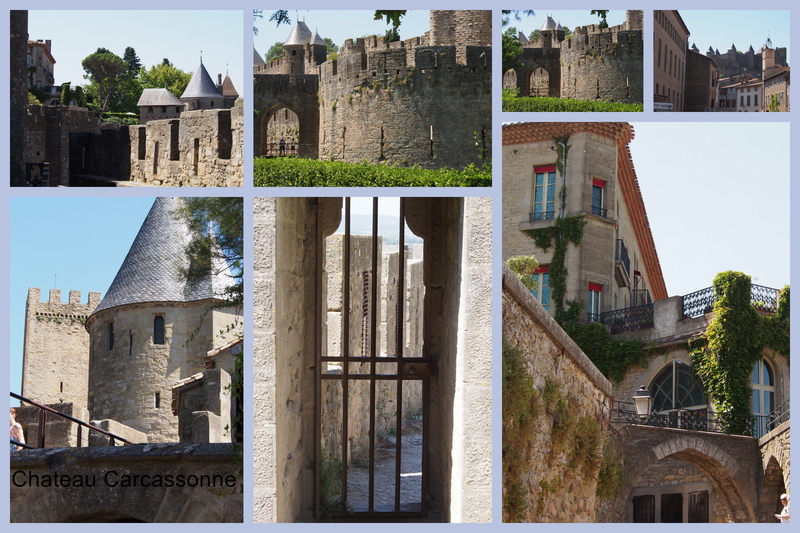 And last but not least is the queen/king of all the Chateau – Chateau de la Cite de Carcassonne. It is a highlight because of the condition of the grounds around the Chateau but still within the walls. Up until 30 years ago there were still close to 30,000 people who lived within the walls of the city. But as tourism grows the walled city has become a huge tourist attraction. It’s still worth wading through people from all over the wall to get into the centre and see both the ramparts and the cathedral – both stunning. It must be all a blur. You’ll never be the same again. Weâll suffer through it and take a vacation for recovery! Well that was like getting 6 postcards all at once!